GILD is laying off a sizable part of its sales force. Layoffs likely connote growth is dead for a while. LOE for Letairis and Ranexa (8% of total sales) could weigh. Generic HCV could be next. There is pain ahead for GILD. Sell the stock. 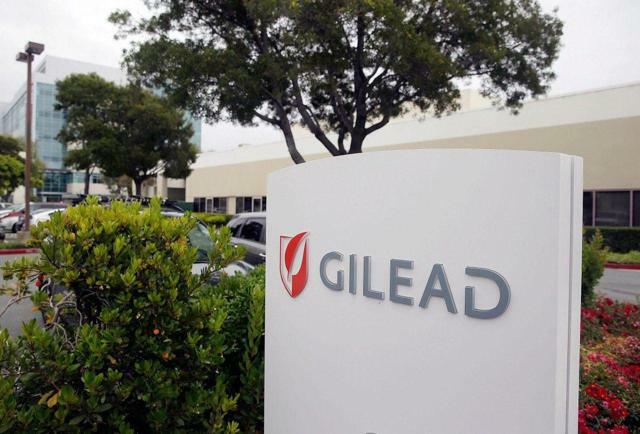 Gilead will lay off around 150 cardiopulmonary sales representatives as generic versions of the firm's heart drugs, Letairis and Ranexa, are set to hit the market. While Letairis and Ranexa brought in $943 million and $758 million, respectively, in 2018 - Ranexa's patent expires next month while multiple generics have already been approved for Letairis. The two drugs generated around 8% of Gilead's overall sales. In total Gilead has 11,000 employees. The redundancy of 150 tenured sales people has been described as a cost cutting move. 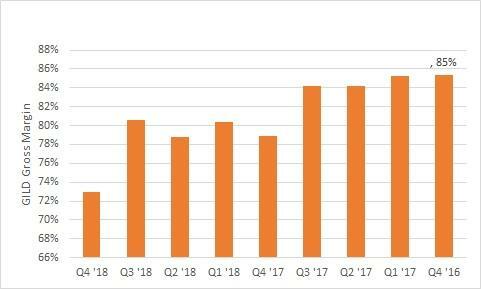 Gilead's Q4 2018 product sales of $5.7 billion were up 4% sequentially. HCV sales fell 18% but were more than offset by HIV sales which rose 9%. The company is less dependent on HCV, which is a good thing. HIV is now over 70% of total sales; as HIV goes, so goes Gilead. That sales growth could come to an end once generic versions of Letairis and Renexa hit the market. Letairis and Renexa had combined product sales of $431 million in Q4 2018, representing about 8% of Gilead's total product sales. Combined product sales grew about 3% sequentially. According to the IMS Institute For Healthcare Informatics, from 2002 to 2014, the price of medicines was reduced by 51% in the first year generics entered the market. This would imply that Gilead's combined sales for Letairis and Ranexa could fall by over $215 million due to a loss of exclusivity ("LOE"). Such a decline could mute Gilead's future revenue growth, potentially hurting sentiment for the stock. Late last year, Gilead announced plans to launch generic versions of Epclusa and Harvoni in the U.S. The generic versions could be launched sometime this year. 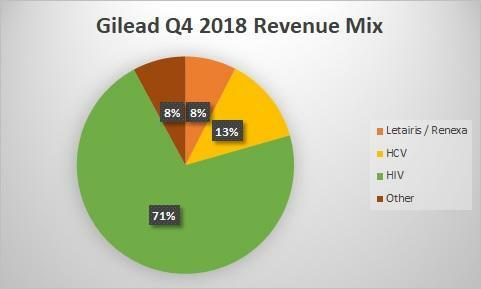 HCV represented 13% of Gilead's total product sales. Harvoni and Epclusa product sales were over 90% ($685 million) of total HCV product sales. Generic HCV could hurt another sizable revenue stream for Gilead. HCV sales generated robust margins for Gilead, allowing the company to cover corporate overhead and fund R&D projects. HCV's free fall has hurt gross margins. Gross margin was as high as 85% in Q4 2016. At the time, HCV was nearly 45% of total product sales. Gross margin was 73% in Q4 2018 - a decline of about 1,200 basis points. Margins could fall further due to LOE for Gilead's heart drugs and potential generic competition for certain HCV drugs. The company is cutting its sales force to offset pending revenue declines. It may have to cut into R&D next. Stagnant revenue growth and falling margins do not bode well. There is no guarantee cost cuts will be able to fully offset declines in gross profit. Secondly, Gilead has a reputation for its ability to produce new drugs in-house. Potential reductions in R&D spending could cause investors to question Gilead's next growth catalyst. Layoffs likely portend GILD's growth is dead. If revenue and gross profit fall due to LOE, then it could hurt sentiment. GILD is down over 10% Y/Y and could fall further. The stock remains a sell.